Apparently Blogger has changed since my last post, and my photos don't magically appear as they used to. So thank you to those who informed me that I had only teased you with verbiage on this amazing sofa! Appearing in Station 8 today!! And there is a matching loveseat/settee too! Does it get any better? Now that you can actually see it?? I fell in love with this piece. I just had to bring it back to Station 8. Simply the best looking vintage leather sofa I've ever found. Tufted! Crackled and worn on the seats. Wood trim with carved details. Amazing color! So, can it get any better? Yep! A love seat/ settee is coming back to the shop as well! I'm starting to think about the change in season, and getting excited about wearing layers again! Scarves, layers of necklaces and some bling. We are coming up on autumn, so check out our new jewelry lines we have in the shop. This is our newest jewelry display case just filled with one of a kind necklaces and bracelets--most are locally made, Lots of repurposed and inventive styles to layer on. And of course, I must show you my latest repurposing of this stripped down antique chair. Put a basket in it, and use it in an entry for storing scarves, hats and headwraps. Or simply leave it empty for a wonderful industrial look! More bling using old pocket watches as fresh necklaces. A bit of animal print is very timely for fall too. This looks like layers of necklaces, but is really just one! All of these photos were taken at the Docks reastaurant in Lakeside, at the fundraiser, Celebrate Life! The highlights from our "off the tracks" event in Lakeside Saturday for Montana Woman! Rachel and I spent Saturday in Lakeside, at The Docks Restaurant, for the fundraiser for Montana Woman Foundation. It was breezy, sunny and quite lovely being waterside! We set up our booths using whites and tone on tones, which created an amazing impact against the blues of the water. You could use this same principle for your home at the lake as well. A look at our new chippy cabinet in the shadows, and our amazing tiered table that would look great in an entry or foyer. Or in a shop! A romantic and surprisingly practical sofa. It's a washable, custom slipcover! Does it get any prettier than this setting? Our booths were billowing and the vintage petticoats looked perfect in the lake breeze! One of our very pretty necklaces in a soft champagne shade. so versatile! We had such fun setting up and displaying some of our new arrivals! Cindy, Rhonda and Laura of Montana Woman. Jessica from Blooming Bellies, the most adorable shop downtown Kalispell. she carries cute maternity and kids clothes, and hundreds of great gift lines you just don't find here in the Flathead! Thanks Blooming Bellies for being the best neighbor at the show! To Rachel for making the amazing displays while I was wrestling with the antique crib for Jessica! And to my team back at the shop for having a great day while I was away! A few shots of our Unpacking team and our new vignettes! Look at the piles of stuff we have for you! We have good looking men...Oh, whoops! That's Josh, he's Amy's hubby, who unloaded all our stuff! Thank you Josh, and Barb's son for getting it all into the shop!! So that we could make it all pretty for Friday shoppers! We REALLY LOVE these late summer looks! Warm tones with some spicy colors to tempt you! we just had to introduce these warm tones on this tablescape! Perfect for late August color palette. So we still have tons to show you. Lighter colors, industrial, shabby chic, cottagey, we have it all. And we will continue to pull the looks together for you in the next few days! Station 8 is "Going Off the Tracks" for the Celebrate Life Event in Lakeside! Join us at this wonderful fundraising and fun event in Lakeside on Saturday! The Docks restaurant, 10-3 PM, then Fashion Show at 4 PM. Station 8 will be there with a vintage booth, featuring custom jewelry too! The Road trip continues with a Barn Sale! There is just something amazing and intriguing about an old barn. That's me, just inside the massive barn doors, getting the frst peek at the vintage goodies inside! Yep, that's my suburban beside this fabulous barn! And this is the sign that drew us in! To this other amazing barn! Filled with treasures. Just waiting for Rachel and me to pick out! So, you first, Rachel, and I'll hold the ladder! Oh, that's right, I climb the ladder, and you hold on to it! Oh my goodness, I have never been in a barn that huge! 3 stories high! I can't carry the picture frames, the old jugs, the shutters, the toy truck, and the giant pulleys AND HOLD ON TO THE LADDER! Wait until you see the vintage yumminess that we found and brought back to the shop! Too much to get in one trailer load, and way too much to show you here. You'll just have to come into the shop to see it all. We unload the trailer tonight. We then work like elves to get it all pretty for the weekend! Yep, we're open on Sundays too! We have made it home safely from another Road Trip Adventure!! Road Trip Day 5 The Adventures of Rachel & Colette continue! I ask my trusty navigator where we're going, always with a smile, since we're on a Buying Trip! We see many great things, like trains! We get to see cool shops in quaint downtowns, like our friends at Ruffles and Rust! We get to see amazing displays that keep us creative. And pinch ourselves that we love what we do, and keep saying "It doesn't get any better than this" every time we find a great piece to bring home! And I get to drool over all the aqua and robins egg blues that I see. Especially with seashells! YUM! So, the good stuff is stashed in the trailer, packed up, and we have lots of great tables, chairs, cabinets, and accessories to bring home. And did I mention we are doing TWO EVENTS, off site "Station 8 Off the Tracks"! Come see our booth at The Docks in Lakeside on Sat. 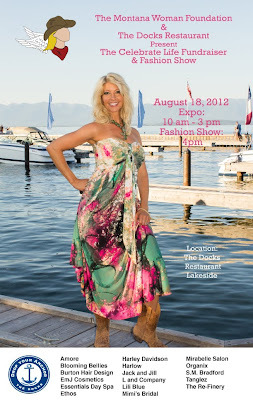 Aug. 18 for the Celebrate Life fundraiser/fashion show. And at the Missoula Fairgrounds on Saturday Sept. 8 for the Priaire Sisters Party vintage show! The Road Trip continues with more goods to load up! We found good stuff!! We found good stuff! As many of you know, my husband is into aviation, and of course, so am I. Look at this amazing propeller we scooped up at the vintage show Saturday!Can't wait to put it on the antique mantel we just got too!! And for my softer side, a French chair, and a new mannequin that is wearing an amazing corset! Of course the challenge is to get it all into the Suburban, and then get it to the trailer we parked somewhere off site. Aah the bliss of loading all our goodies! Now sometimes we just have to take a break from all the loading, and Rachel seems to be taking a break with our new friends! Yep, that's all our stuff scattered around the parking lot! Boy do we have fun!! I know it doesn't look that exciting, but trust me, under those blankets are some amazing tables! This is just lettting you use your imagination about what's under the blankets and the surprise of it all once we get home and unload our new vintage pieces!! Road Trip # 15 is going really well. Or is that #18? We've lost track of how many trips, but boy do we have some fun stories we tell about every trip we go on! This is no exception! Great tables, chairs, industrial metal cabinets...it's all packed in the trailer! Some fresh fabulous merchandise for August! It's time to lighten up...with colors that is! Mid summer is the perfect time to add some light greens, celadons,and citrines to your color schemes. This 1930's dresser is the perfect vintage green. Great for a bathroom, entry or mudroom! The mirror can be removed, or why not keep it on, to check hair and makeup, as you run out the door?Dressers don't just have to be in the bedroom anymore. Or perhaps a bit of Bitish wall decor! Summer is peaking, so now's the time to refresh and have a bit of fun; indoors and out!